Once the mold is made, it can be used for multiple castings, one at a time. 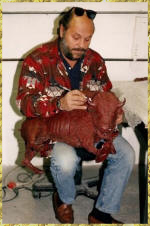 First, wax is painted into any intricate details that might not be filled correctly. Then the mold is locked and banded together. 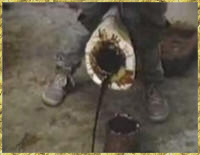 Molten wax is poured into its interior, with any excess allowed to drain out. 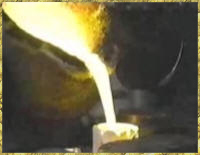 This process, which is similar to dipping hot-wax candles, is repeated until the cooled wax has the desired thickness of the final bronze casting. When the mold is removed, Obara inspects the hollow wax, touching up the parting lines and working fine details back into the wax. Because each mold is cast individually, with special attention from the sculptor, each bronze casting turns out slightly different. In the next step, wax gates and sprues are fitted onto the wax piece. These serve as conduits for metal to flow to all parts of the casting. The wax is then coated with a slurry, both inside and out. 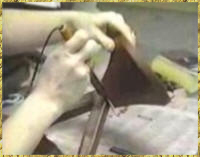 A thin slurry is used for the first coat to retain the detail of the wax. Successive coats use a thicker slurry for a faster build up. Then the slurry-coated wax is covered with a sand composite, and the process is repeated until the desired thickness is achieved. Each coat needs to be dried before the next can be applied. This coating and drying process can take from a week to a month. If not completely dry, any remaining moisture will turn to steam and it will explode during the burn-out phase. 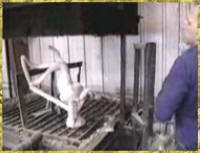 Next comes the burn-out phase when the coated wax is heated to such a high temperature it melts out from between the inner and outer coatings, thus the name, lost wax process. The heat also fuses the coatings into ceramic shells that are hollow from where the wax used to be. Once the burn-out has fused the ceramic and melted out the wax, the sculpture is read to be poured. If the pour is not done immediately after the burn-out, it must be dried again. 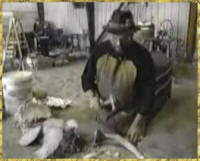 Once dry, molten bronze is poured into the ceramic shell. After the bronze has been poured and cooled, the ceramic shell is removed. This stage completes the actual casting process. The final step is finishing.